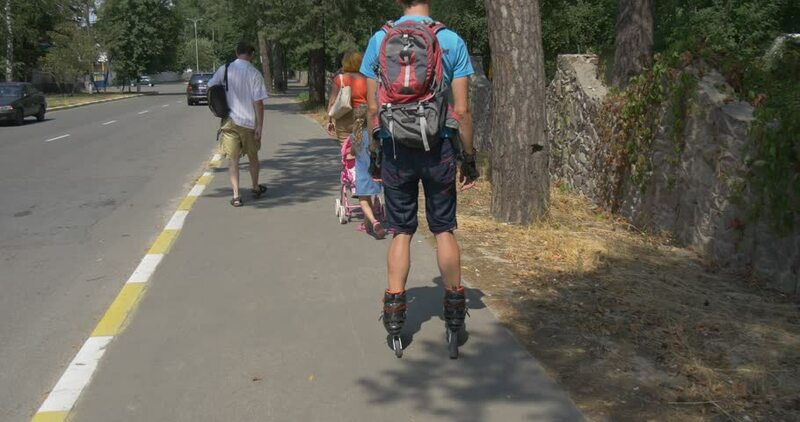 BUCHA/UKRAINE - JUL 19 2015: A group of people is walking in a park, young man rides roller-skaters, a little girl drives a baby carriage, other people walk close to them, sunny, day, Ukraine. hd00:08BUDAPEST/HUNGARY – 25 SEPTEMBER, 2018: Bicycles on Margit island in Budapest. hd00:21EVENT VRHNIKA JULY 2015:Here you can see two competitors during cycling through the beautiful landscape in cycling marathon. hd00:07VRHNIKA, SLOVENIA - JUNE 2014: Cyclists driving beside a cliff on a road. Driving passing professional bicyclists racing in competition around the countryside.